Being a warehouse worker can be one of the most physically demanding job. 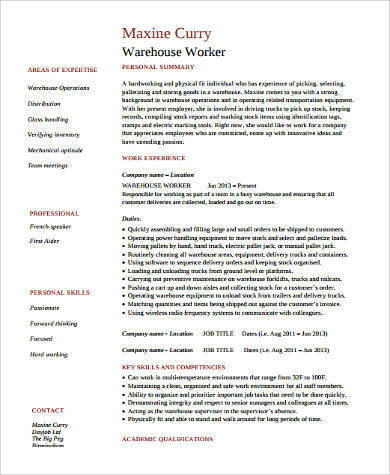 Most companies who are hiring warehouse workers make sure that their employees are physically fit, preferably with no health conditions that may affect their job, and capable of doing warehouse works that may include lifting, operation of tools and equipments, and other physical activities. 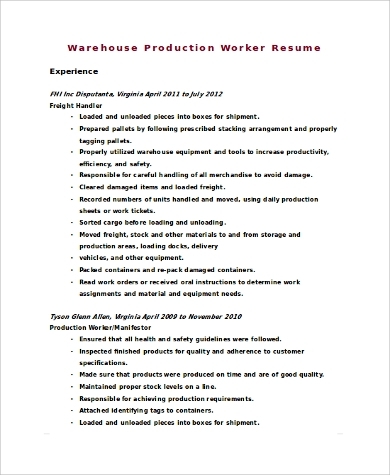 If you want to apply as a warehouse worker, your resume shall include items that will point out your physical strength and your ability to work on a challenging environment that requires an ideal physical health. 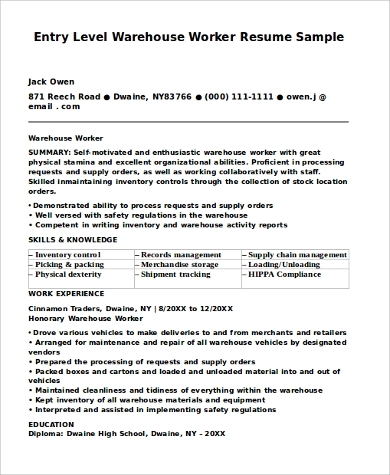 We provide Sample Resumes that can help you build your own should you want to apply for a warehouse worker post and many others. Location of items. A warehouse worker should develop a system to store goods and other products so that it is easy to find whenever these items are needed to be shipped. Equipment operation. There are warehouses that store big items. Thus, the need of automobiles and equipments like a lift is needed. Being able to operate different equipments is a requirement for warehouse workers. Inventory of goods. The warehouse worker should be able to keep a record of the items that they are keeping, have received, or will dispatch. This is for them to not be held for any item loss. Sorting of products. There are warehouses that store various products. 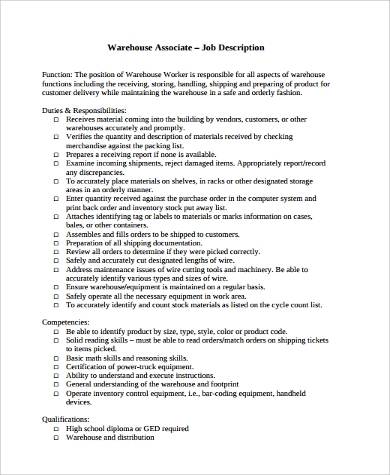 A warehouse worker needs to sort items depending either on their usage, material, or size. Receiving of items. Warehouse workers receive items from manufacturers and other establishments whose products needed a duration of storage and safekeeping. Checking product conditions. The condition of products in a warehouse should always be checked. Warehouse workers need to know if there are damages to the products for immediate reporting and recording. 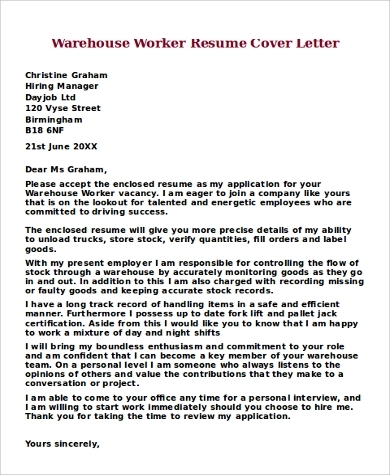 If you are already decided to work as a warehouse worker, and even on other industries, our downloadable Sample Work Resumes can give you examples on how to create a resume fit for the job that you are applying for. 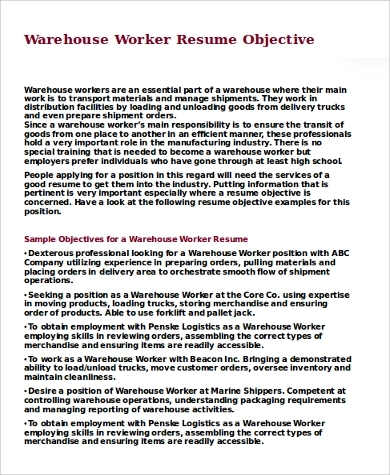 If you think that you can tolerate the physical demands of the job, no doubt that you can be a warehouse worker. Moreover, it is not only the physical health that matters. 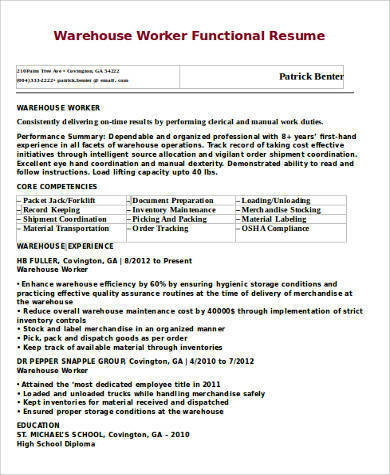 If you want to work for a warehousing company, you need to have a deep understanding of organizing things, filing and documenting skills, and knowledge on how certain items and materials shall be stored. Resumes truly depend on the job that you are applying for. 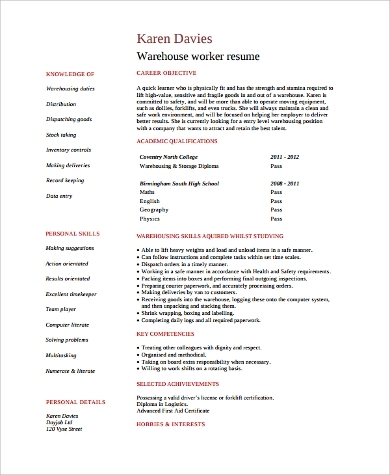 As this article help you understand the job functions of a warehouse worker and provide tips on what to put on your resume, you can already create your own comprehensive resume that will help you get the job. 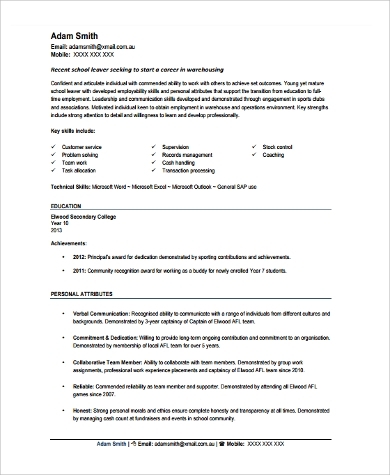 We have Resume Samples that you may take a look at for your reference. They will give you insights and ideas on how you can properly create a resume for your future job applications.